A reception area is an important part of any office. This is where your clients are likely going to be when they first visit your premises. It is important to make a good first impression when it comes to new visitors and so this is why your waiting room should reflect your business in the best possible way. 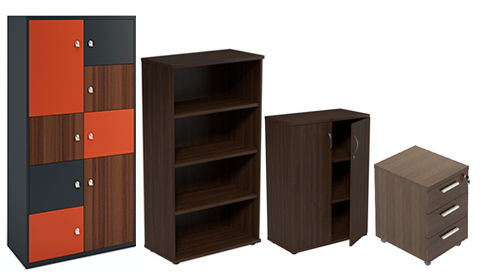 Your office reception area furniture should be comfortable, durable and the style should reflect your brand. Our online megastore offers an array of waiting room furniture to perfectly create a sense of elegance as well as offering practicality and durability to any workplace. Choose between our selection of reception desks and counters, soft seating lobby chairs, beam seating and reception tables to impress any clients and visitors. Our reception desks are fully modular, the smaller desk units can be configured to create the counter shape and design of your choice. The desk, counters and tables for waiting rooms are offered in highly stylish finishes and designs. You are spoiled for choice between popular wooden finishes in either oak, maple, beech, walnut and more. 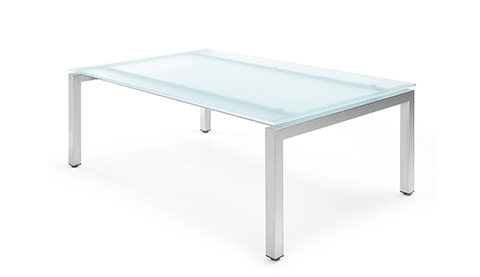 The lobby tables are also offered in glass finishes if you wish to add a touch of sophistication to your area. The reception seating in our catalogue offers a variety of modern, contemporary and stylish designs. 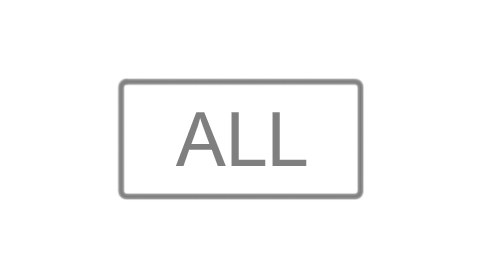 Different selections of fabric colours and finishes are on offer. Choose from upholstered leather/faux leather in black or brown for a more elegant look or a brightly coloured sofa in either blue, green, red, yellow and many more for a fun and relaxed look. 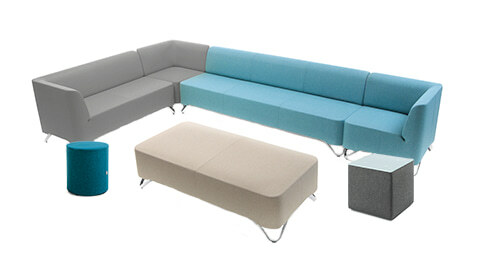 Beam seating is also a great and practical option if you are looking to maximise your reception space. We supply beam seating in an array of sizes (2-5 seaters) and finishes in either plastic, upholstered or wood. Reception area furniture needs to offer both functionality, durability as well as a stylish design to reflect your business in the best possible way. 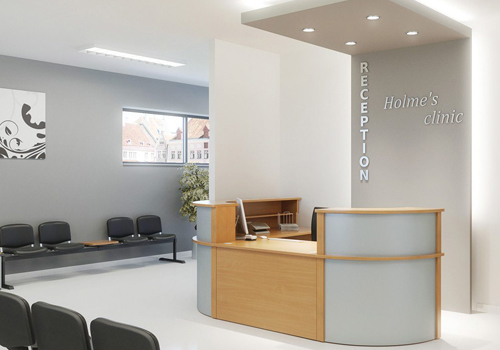 Reception desks are particularly important for places like beauty salons, spas, hotels, offices, hospitals and colleges. Your reception area is the first place your visitors will see, so it’s important to make a good impression. 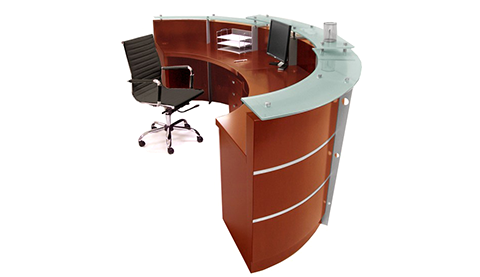 Radius Office Furniture has a wide range of high-quality reception desks in wooden, metallic or glass finishes. We have classic receptions desking styles as well as modern desks boasting LED display. Our lobby seating furniture is specially designed to give the highest level of comfort for the users, perfect addition to areas around the workplace where high levels of comfort and relaxation are desired like the reception/waiting room area or a breakout area. Modular options are also offered in this category, ideal for receptions who wish to accommodate a good number of people at a time. 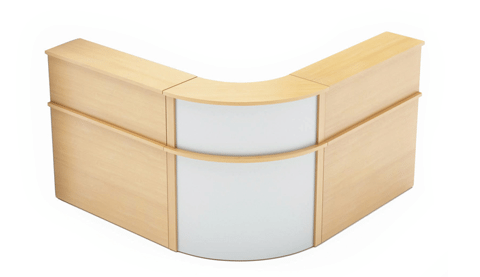 Our beam seating is perfect for places such as hospitals, dental clinics and banks. 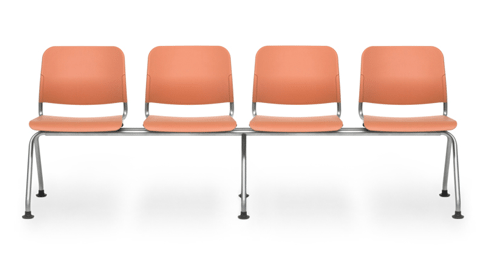 These chairs are highly durable and practical when it comes to saving space in the waiting room. The lobby tables on offer are the perfect addition to complement our reception seating range. We have a wide range of attractive reception tables which would enable you to provide your visitors and your clients a place where they can set their coffee cups down while waiting. They are also ideal for showcasing some of your business catalogues and brochures that your visitors can browse through as they wait. These reception tables are offered in an array of shapes and sizes to perfectly suit your needs. We have round lobby tables, square and rectangle shaped table tops. 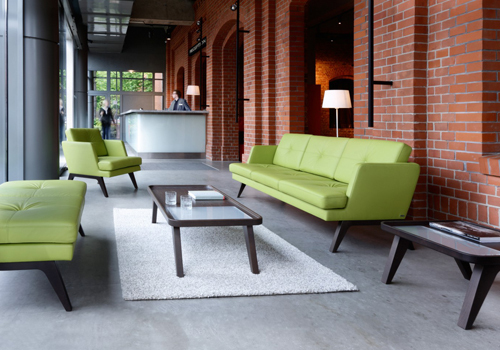 The furniture in our reception range are sourced from some of Europe’s leading furniture manufacturers to ensure you are getting the best piece of furniture for your money. Furthermore, a large selection is offered with a warranty, meaning its performance and durability is guaranteed during that period of time. If you’d like to find out more about our range of Reception Area furniture or discuss your requirements, simply request a callback.